Could this be the new flagship Android phone? Images of a new HTC smartphone leaked online over the Labor Day weekend, sending the rumor mill into overdrive. The Chinese PhoneHK forum where the leaked images originated has since taken the pictures down, but not before the blurry shots had a chance to spread across the web. First the facts. The leaked handset has a slim black form factor with red accents along both sides of the device, consistent with the design of HTC's past Android phones for Verizon. 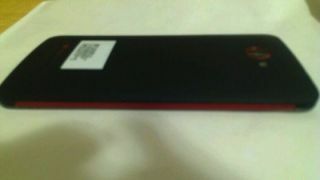 A blurry Beats Audio logo can also be seen on the back of the mysterious smartphone, confirming its advanced sound capabilities. Sadly, that is all that can be gleaned from the leaked shots, but that doesn't mean that the speculation stops here. Could it be HTC's rumored 1080p handset? The prevailing rumor is that the timing of the leaked handset matches up nicely with earlier rumors of a 1080p capable HTC device. The HTC6435 was recently revealed through a benchmarking site, notable for offering 5-inch display supposedly capable of full HD resolutions. It's also rumored to pack a 1.5GHz quad-core Snapdragon S4 chip with an Adreno 320 GPU. However, the initial benchmark stats suggest it outperforms traditional S4 processors, suggesting it may be a modified version or even the next generation of chips. It's still unknown if there is any connection between the leaked HTC handset and the powerful HD device rumored earlier this year. If it turns out to be true, the mysterious smartphone could become a new flagship Android phone for Verizion to help balance the excitement over the rumored iPhone 5 and new Windows Phone 8 devices.